Are you looking for HP Police Recruitment 2019? 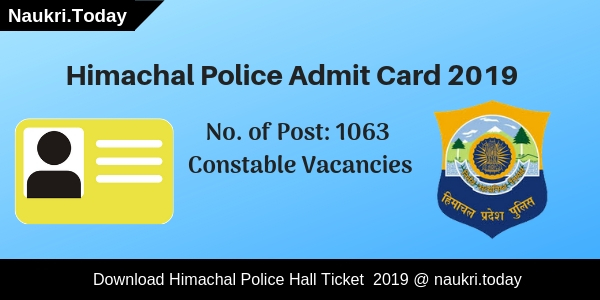 If yes, Himachal Pradesh Police Department has released notification for recruiting candidates on 1063 Constable Vacancies. Interested applicants may apply online for from 30 March 2019. Participants should fill up their application form before the closing date that is 30 April 2019. Aspirants who are going to apply must have 10+2 Standard Pass Certificate. General and OBC Category aspirants have to submit Rs. 140/- as an application fee. The Department will charge Rs. 35/- only to the SC/ST/Ex-Servicemen category applicants for HP Police Jobs 2019. For further more details aspirants should read below article carefully. 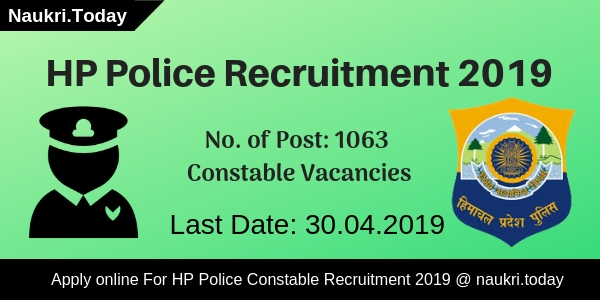 Fresh Update as on 13.04.2019: Candidates can apply for HP Police Recruitment from given below direct link. The Department will be shortly closing the online registration process on 30.04.219 for 1063 Constable posts. Fresh Update as on 25.03.2019: Dear Participants, HP Police Department is going to appoint candidates on 1063 Constable Posts. Interested candidates should check here eligibility criteria. Candidates may apply online for HP Police Recruitment 2019 from links given here before the last date 30.04.2019. AM I Eligible For Applying HP Police Bharti application Form ? How Can I Check Eligibility Criteria for Himachal Police Recruitment 2017 ? What is the Exam Pattern & Selection Criteria for HP police Constable Bharti 2017 ? Education Qualification For HP Police Jobs 2019 10+2 Standard Pass Certificate. 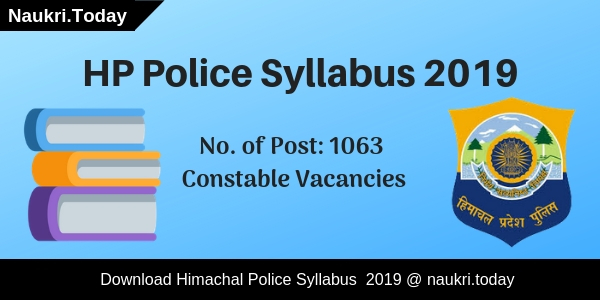 What Are The Physical Standard Criteria For HP Police Vacancy 2019? The Department has set some height and Weight measurements for Male and female applicants. 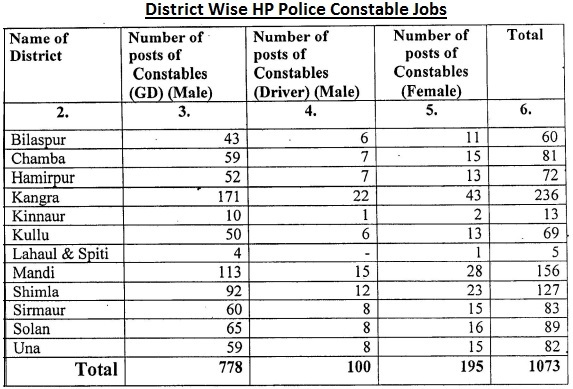 Here we provided you table which consists of Physical standards for HP Police Jobs 2019. 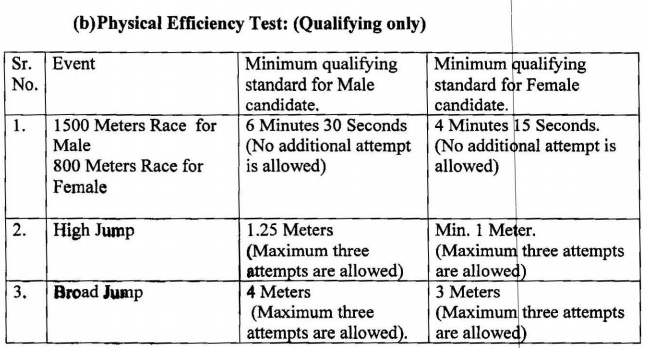 What Are The Physical Efficiency Test For HP Police Constable Vacancy 2019? Conclusion: Himachal Pradesh Police Department has published notification for 1063 Constable Vacancies. Interested and eligible candidates may fill up their application form for HP Police Recruitment 2019 before the last date. Are you waiting for HP Police New Bharti 2017 – 18 ? ?, then here is very important news for you. Himachal Pradesh Police department has published a vacancy advertisement of 1073 Police Constable (Male & Female) & Constable Driver Vacancy. Candidates who have passed 10+2 Qualification can fill application form for Himachal Police Recruitment 2017. Mode of Submit Application form through offline mode. Closing date for submit hard copy of Application form for Himachal Police Bharti is 21st July 2017. Himachal Pradesh Police is inviting application form for those candidates who are looking for HP Police Recruitment 2017. Submission of Prescribed application form has been started from 01.07.2017. Candidates who are interested first they check “What is the Required Eligibility Criteria For Filling Form for HP Police Bharti 2017 ?”. To get more information about Himachal Police Constable Vacancy 2017 like pay Scale, Application fee etc. you can check given below details. Himachal Police Constable Vacancy 2017 Education Qualification : Applicants must have passed 10+2 (Intermediate) qualification or equivalent qualification from any recognized Board for applying application form for HP Police vacancy 2017. For more information check Himachal Police Jobs Notification 2017. Age Limit Fir Himachal Police Vacancy 2017 : Age of the candidates for Himachal Police Recruitment 2017 should be 18 years to 23 years as on 01.07.2017. Age relaxation is applicable up to 02 years for SC/ST/OBC, 05 years for Home Guards for HP Police Bharti 2017. Application Fee For HP police Recruitment 2017 : Candidates of General category must paid Rs. 140/- as application fee for HP Police Constable Vacancy Form. Other category applicants like SC/ST/OBC/IRDP should paid Rs. 35/- for filling up Himachal police Application form. Fees must be paid through offline mode by Bank Draft/IPO in favor of the District Superintendent of Police Concerned. Himachal Police Constable Bharti 2017 Pay Scale : Selected candidates will paid initial pay of Rs. 7,800/- under pay band Rs. 5,910/- to 120,200/- + GP Rs. 1,900/-. after completion of 08 years regular service candidates will paid pay band Rs. 10,300/- to 34,800/- with grade pay Rs. 3,200/- for Himachal Police Vacancy 2017. Selection Method For Himachal Police Bharti 2017 : Selection of the candidates for Himachal Police Recruitment 2017 will be made on the basis of Given factor. Final selection will made on merit based. 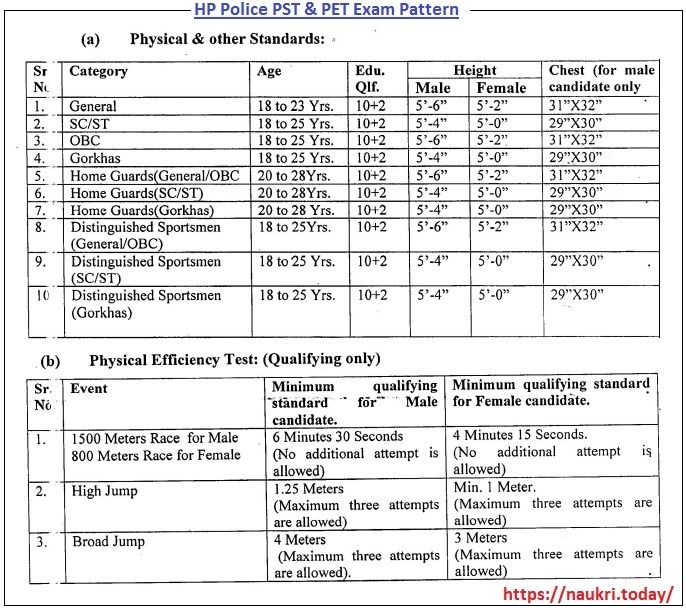 More information about Exam Criteria for HP Police Driver Vacancy/ Himachal Police Constable Jobs you can get from official notification or from below para. First of all candidates call for PST Test for recruiting candidates on HP Police Recruitment 2017, after physical Standard Exam selected candidates call for PET Test. Process for PST & PET Examination is shown in below image. Now the passed candidates after Physical Examination appear in written examination. which is objective in nature. Test will contain 80 Question of 60 minutes Duration. Final selection of the candidates will made after Personality Test. Candidates keep visit this page for more updates about Himachal Pradesh Police Jobs 2017. First of all candidates visit to the official website www.hppolice.gov.in. Now Click on HP Police Notice Board >> Police Recruitment Notification link. After that click on Download Himachal Police Recruitment Application form link. Fill all required information in form carefully. Now attached your recent passport size Photo & required documents with form carefully. Now deposit application fee & Attached with application form. Send the application form on correct postal address before the last date. Himachal Police Recruitment 2017 For 1073 Police Constable & Constable Driver vacancy. Applicants can fill application form for Himachal Pradesh Police Jobs on or before the last date, that is 21.07.2017.